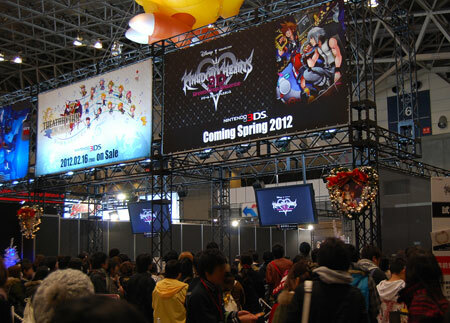 First off we have March 2012 listed as the release month for Kingdom Hearts 3D in Japan! Third, we have trailer impressions thanks to aibo_ac7 and thanks to SQEXGAL for translating them! Master Xehanort, the skilled keyblade master form has changed. He stood in the way of keyblade wielders from before who fought to protect the light, and has yet to be stopped. 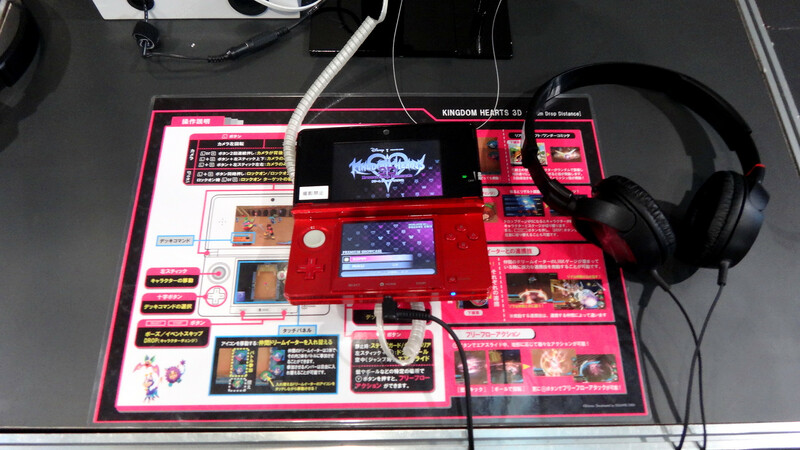 The screen is spit in half, left is Sora, and to the right is Riku. Joshua: Well, it seems like we’ve both have been seperated when arriving in this world. 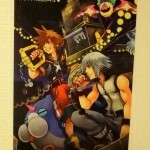 Sora to Neku: Noise?… What’s your name? Sora: Neku… Sakuraba… That’s an interesting name! Neku: I don’t think it’s so interesting. Shiki while holding Mr. Mew: You came to rescue weak little me, didn’t you? Mr. Knight! Riku: Huh, Knight?! That’s not what I am! Shiki: …you seriously shouldn’t be so embarrassed. Mickey: Maleficient, what are you trying to accomplish? Maleficient: Do you know Xehanort? Mickey: Why would I know him? Maleficient: I found out from him, about the worlds 7 ones of pure light. With the 7 in my grasp, the worlds would be mine. Pinocchio: Huh? My nose, what happened?! Jiminy: It’s surely because you told a lie. Pinocchio: That’s not true! There was a guy in a black coat. He was messing with Sora. Hanging his head, Quasimodo turns over in his bed. Sora: This is a keyblade! Mickey: Shh! I know. It came from another world. To be honest, that’s the reason why I’m in this world to be a Musketeer. While inclining his head, Sora replies: You don’t remember being a king in your world? Riku opens a large chest, and inside is Minnie! Rhyme with a floating moogle. Rhyme: My memory!… I have to go back right now. Beat: Get out! 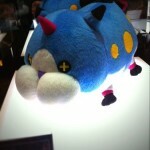 Dream eaters! 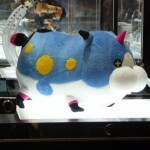 A dream eater appears in front of the approaching Beat. Sora: Neku, that’s a dream eater? Neku: Ah, you can fight them too, right? 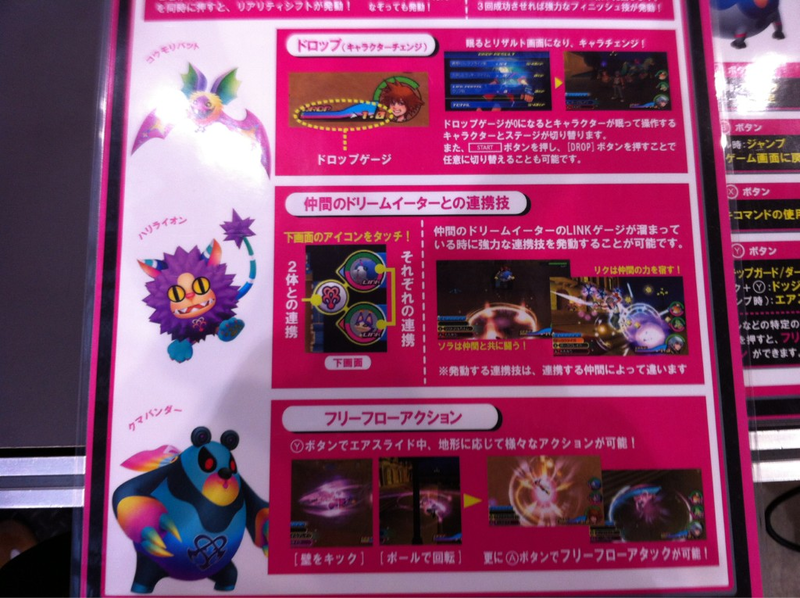 Suddenly, a man in a black coat and dream eaters appear. Neku: This isn’t the time to talk! In the beginning, while the worlds engulfed in darkness were reborn, their rebirth was in complete and the worlds fell into slumber. Even though the worlds have gates to them, the heartless could never enter through them. Therefore, in the heartless stead and another threat from the darkness existed. Those were the ones who devour dreams; the dream eaters. Within them, there are the Nightmares that plant bad dreams, and the ones who eat the nightmares; the good spirited Spirits. These are the two creatures that exist in this world instead of the heartless. 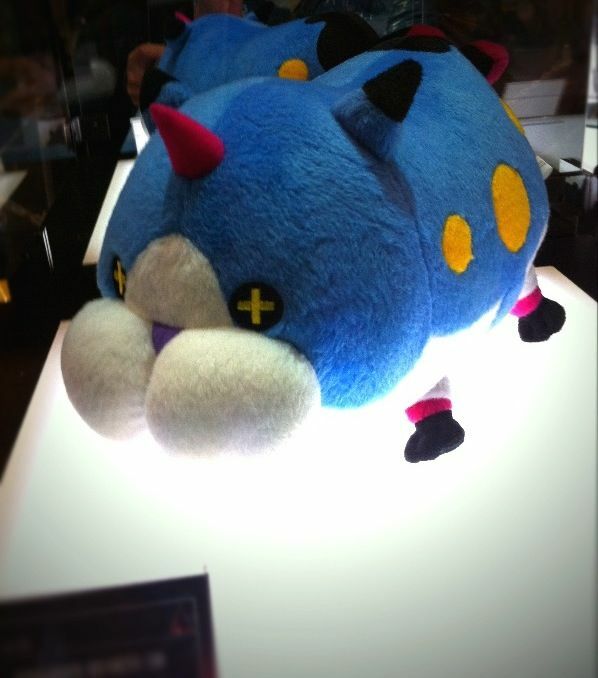 These creatures that live on the opposite side of the world’s gate, with the dream eaters guidance you can find the Key to Sleep. Sora: Yen Sid said, the worlds that cannot wake from their dreams… if they can’t wake up, they won’t be able to be reborn. Joshua: It’s the same, however, it may be different for other worlds, if it’s only one is impossible to say, get it? Scene of Pinocchio being swallowed by the whale. Mickey, facing Pete onboard a steamboat: Over there is Pete! Joshua: Didn’t Mickey give up on you? If he gave up one you, isn’t that the same as giving up on the worlds? Riku: What the hell are you saying? Axel (in black coat): I came here to look, because I always get stuck with the dirty work. Mickey, Donald, Goofy, and Sora collectively point their swords: All for one, and one for all! Riku to Quasimodo: You can’t tell what a person is like just from looking at them. I have a friend too who can see right through me into my heart. Sora to Joshua: It’s okay, because Riku heart and mine will always be connected. That’s why the feeling you had must be connected. Riku before the dark hooded man: What are you? 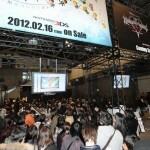 The man lifts off his hood revealing that same face as Riku. 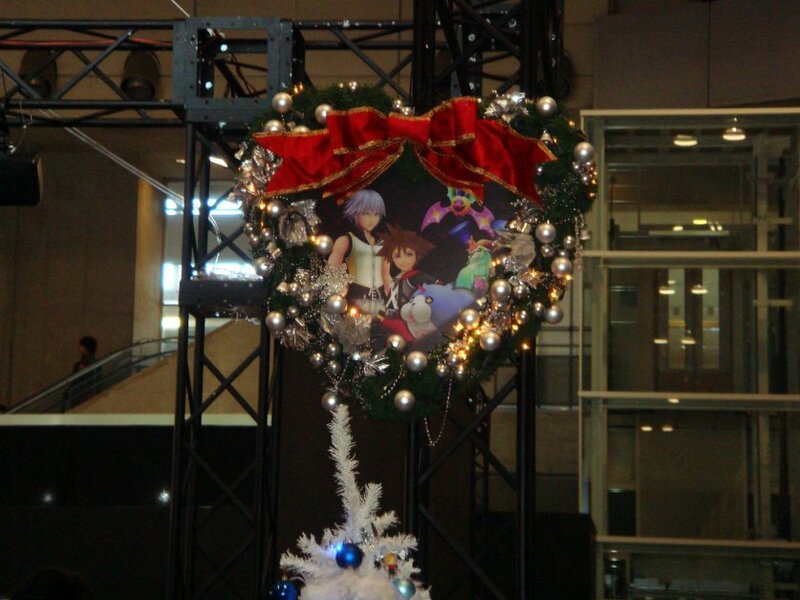 Sora: Even you guys can have hearts? Riku: You… Who are you? 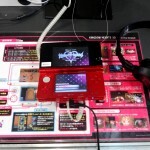 Terranort faces Sora: Your heart also wasn’t trapped? Sora: Your the guy from before! What did you just say?! 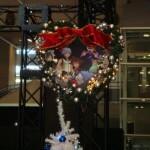 Terranort / Vanitas: You heart is the exception! 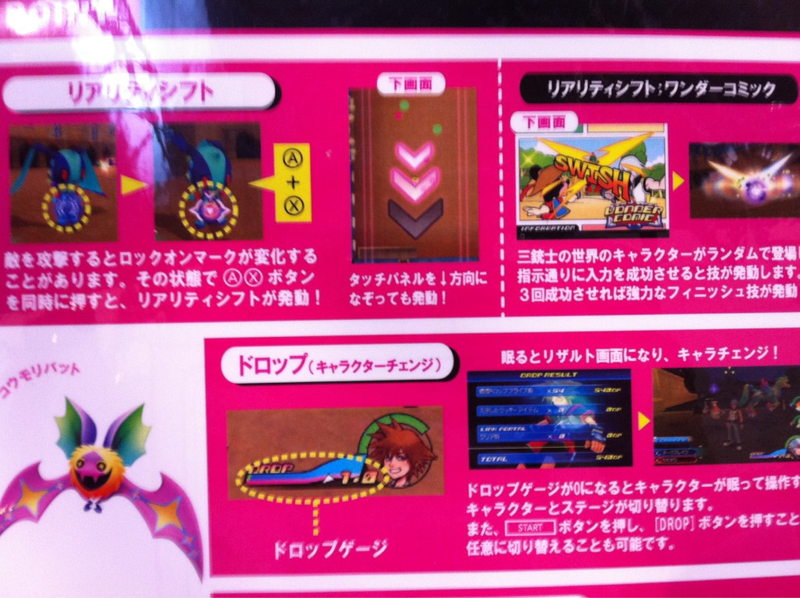 Info on the Drop gauge from what I can read, when the Drop Gauge drops to 0, the character (dream eater?) has to sleep. Pressing start and then hitting the “Drop” button will switch characters. Wonder Comic is the Reality Shift ability in the Musketeers World. 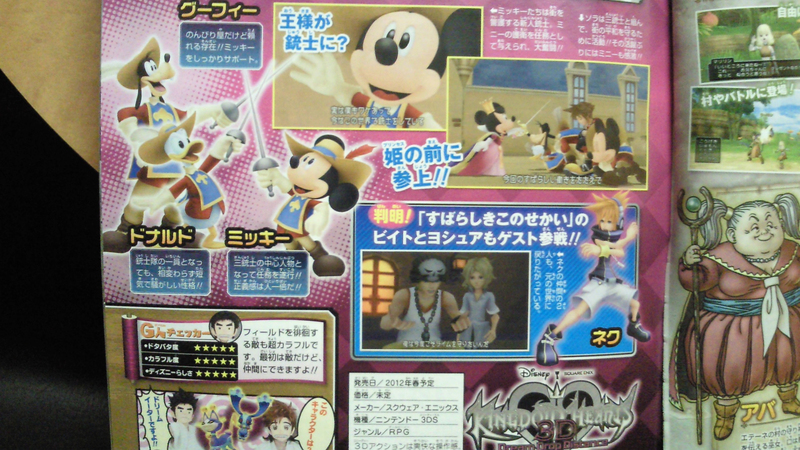 Sora appears in the 3 Musketeer world in the demo, Mickey doesn’t know Sora but Mickey discusses with him Keyblades and other worlds like Tron: Legacy. 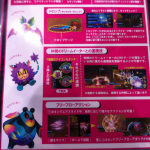 In Sora’s demo he teams up with Wondernyan, Neko Cat, and Zou Elephant. 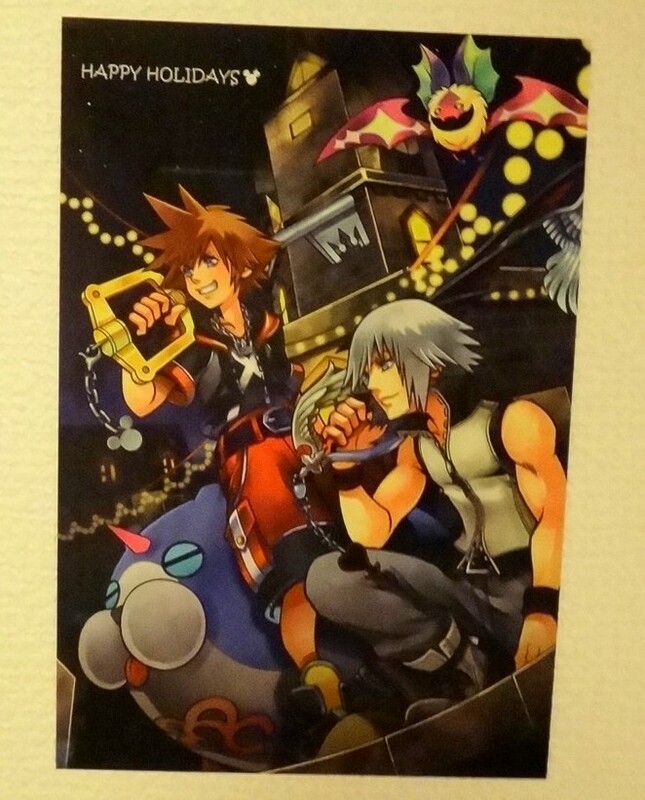 In Riku’s demo, he finds Pete at the opera house. Pete has set a trap for Mickey and company. Riku chases after 3 baddies behind the theater equipment. Yagi Horn, Frog Chef, and Poisonous Lizard were Riku’s Dream Eaters. Thanks to Toma_Kisaragi we have the full VJump scan! The main cast of Square Enix game It’s a Wonderful World/The World Ends with You , including Joshua and Daisukenojo “Beat” as seen in the image from V-Jump magazine. In addition to these two, Beat’s younger sister Rhyme is slated to appear, as well as Neku’s first week partner, Shiki Misaki. 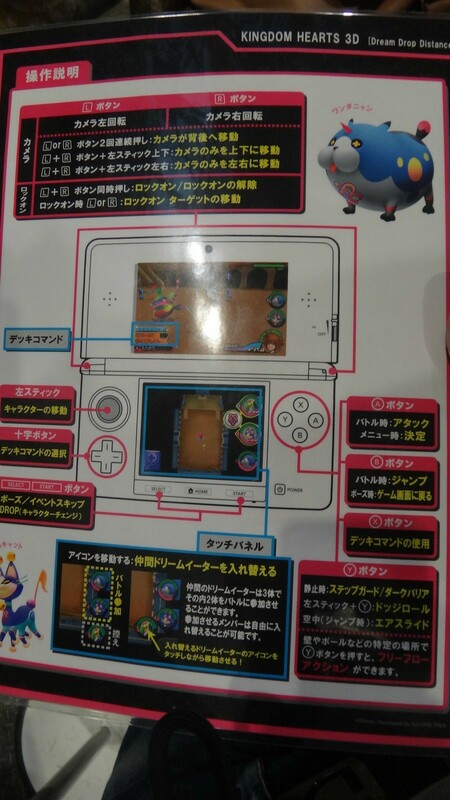 At this time, it seems that they all appear at some point in Traverse Town. La Cité des Cloches has also been seen with both Quasimodo and Frollo appearing. One of the biggest revelations has been in relation to the world of TRON returning, but this time as the world seen in the 2011 movie TRON: Legacy. 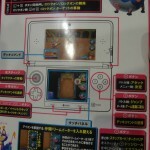 Apparently it appears in the form of a shooter game, with the vessel coming out of the screen. This sounds like it could be re-enacting one of the final scenes from the movie, in which Sam and Kevin Flynn, along with Quorra are being chased by CLU, Rinzler and their men. It would seem this is more of a sub-world, like Space Paranoids was, as opposed to a full-fledged world. King Mickey, Donald and Goofy all re-appear in the world of The Three Musketeers, shown to be named “The Country of The Musketeers”, but they are not the trio that we know from other games in the series. Although Mickey seems to know some information about the Keyblade and also Sora, he is not the same King Mickey that we know. In addition to this, the world seems to be adorned with many stages, and a mention of opera also comes forth. The Musketeers seem to go by the motif of “All for one, and one for all”. 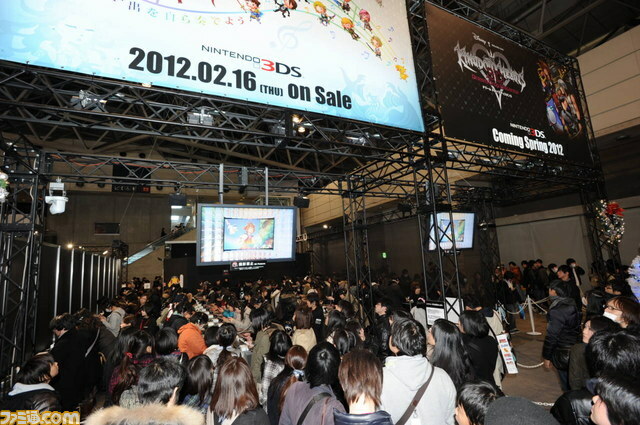 Some of the members of Organization XIII have also been seen in the trailer. 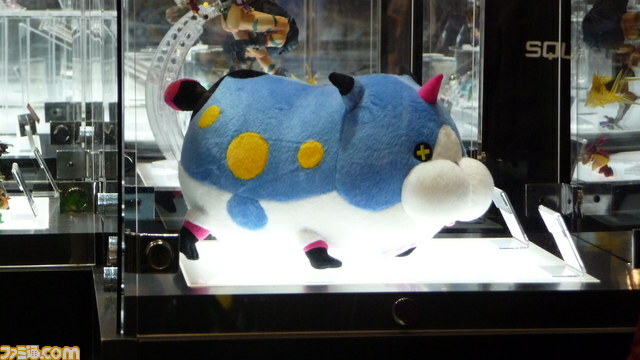 Zexion seems to appear in his Birth by Sleep attire, wearing a white lab coat. Lexeaus also appears, although it isn’t clear if he is in the Radiant Garden Guard uniform or his Organization cloak. Axel also appears in his Organization cloak, but it seems that he is in the mindset of his Somebody, Lea, as seen when he states “The name’s Lea. Got it memorized?” How much of his past will come to light? Maleficent is set to appear, as well as Pete. It seems that she is after the Hearts of Pure Light, although this time it seems that these hearts reside in each world. She also makes some reference to (assumedly) Master Xehanort and his quest to find the Hearts of Pure Light in Birth by Sleep. 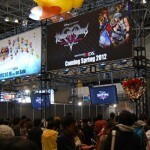 Some scenes with both Riku and Sora take place, as well as Master Xehanort appearing. The trailer ends with a boy appearing in an Organization cloak and eventually reveals his face to be none other than Vanitas! We’ve learned that in one of the trailers we see Riku in the Tron: Legacy world in what apparently is a lightcycle race on the Grid, while Sora is battling against Rinzler. Sora and Riku’s costumes have also changed to match the style of Tron: Legacy, so look forward to all of the iconic “Tron lines” in this world! The pre-rendered scenes are described to be similar to a “picture book”, perhaps in the way that the scenes cut to each other and pop out to fit the 3D theme? It starts with Sora falling into Destiny Islands with Donald and Goofy there, then Kairi and Riku appear. Riku seems to be consumed by Darkness, then the scene changes to Sora and Kairi in the cave on Destiny Island, then to Xehanort extending his hand out. 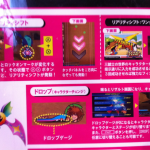 The scene switches to Sora in his dive into heart, then he is falling down the middle of a staircase. Kairi is staring out then she ripples into Naminé. At the bottom of the staircase lands Roxas in his casual clothes with Xion there, then they both clash Keyblades. The scene changes into Roxas and Axel fighting like in Kingdom Hearts II, then the image of Roxas is overlaid with Sora. 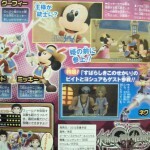 The next scene features Sora and Riku fighting against Xemnas, then King Mickey (?) against Xehanort in the Keyblade Graveyard. After the battle scenes, it shows Sora, Riku, and Mickey, then a series of pictures come on screen one of them showing Roxas landing in the Keyblade graveyard waiting, then flutter away like paper falling which ends the pre-rendered scenes. From the blogger’s second look at the trailers, they say that Isa/Axel’s hair when he is in the Organization XIII coat is in the style of Isa’s hair. Also, in the demo the blogger got to play as Riku and fight the boss of the Tron: Legacy world/sub-world. 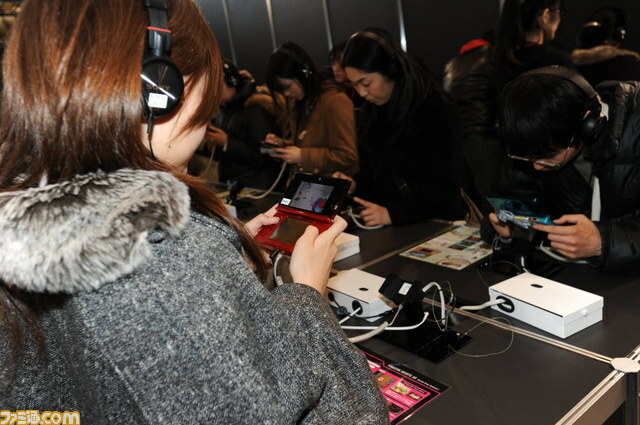 They comment that some of the music is familiar throughout the demo. 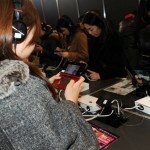 Jump Festa 2012 is now over! Thank you to all our readers for stopping by!